Last week, in sweeping votes from both chambers, the Washington State Legislature took major steps to address the emergency facing southern resident orcas and the systemic problems of salmon and Puget Sound recovery. Four bills that will protect orcas passed out of the House or Senate, and most with bipartisan support! Together, these bills will increase food for orcas, give orcas room to eat, reduce the risk of oil spills, and prevent toxic pollution. Ask your legislators to keep up the momentum and stand up for orca recovery in upcoming votes! Last week, the Washington State Legislature took major steps to address the emergency facing southern resident orcas and the systemic problems of salmon and Puget Sound recovery. Four sets of bills that will protect orcas passed out of the House or Senate, and most with bipartisan support! In the coming weeks, you will see bills coming from the opposite chamber. 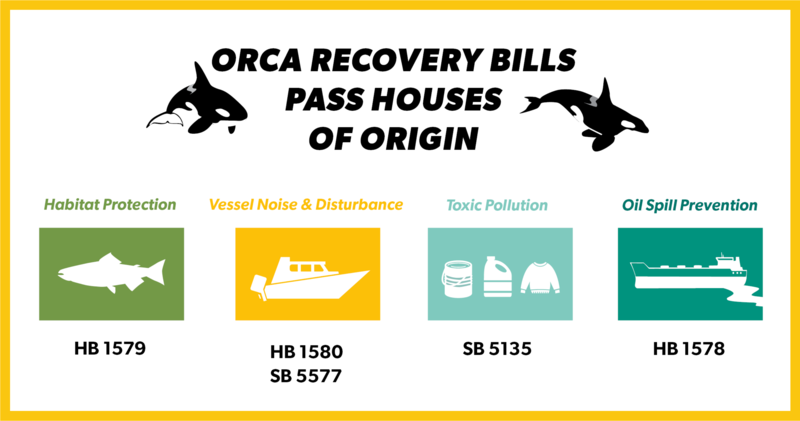 Please support these important protections: •	Habitat protections (HB 1579) •	Vessel noise and disturbance (HB 1580 / SB 5577) •	Toxic chemicals (SB 5135) •	Oil transport safety (HB 1578) These are important to me personally as a resident of your district and are necessary pieces of orca recovery.